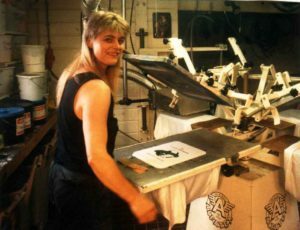 picture: Motomania’s Top silkscreen printer Elisabeth Ros printing your motorcycle T-shirts. Motomania designs are printed on shirts and (hooded) sweatshirts by “FRUIT OF THE LOOM” Print is on the front, unless indicated otherwise. All Silkscreen printing by hand. No heat transfers! Small differences in sizes are possible. Advise: take a shirt that fits you well and compare it with our size table below.